Bad behavior has never been so much fun. Artistic director caryn desai [sic] jump starts International City Theatre's 27th season at the helm of Yasmina Reza's scathingly funny, Tony Award-winning God of Carnage. The limited, four-week engagement runs January 27-February 19, with low-priced previews on January 24, 25 and 26. Here's a chance to see this hilarious comedy in ICT's more intimate setting and watch the fur fly up close! God of Carnage is a comedy of manners... without the manners. When two 11-year-old boys in Brooklyn's upscale Cobble Hill neighborhood have a playground fight, Henry's parents (Leslie Stevens and Greg Derelian) invite Benjamin's mother and father (Alet Taylor and David Nevell) for cocktails, hoping to discuss the situation civilly - to "practice the art of co-existence" rather than "slaughter each other with insurance claims." But the veneer of polite society quickly falls away, and the evening deteriorates into a laugh-out-loud train wreck of finger-pointing, name-calling, tantrums and tears. And that's before they break out the rum. French playwright Yasmina Reza's comedy, translated by Christopher Hampton, nabbed both London's Olivier Award for Best Comedy and Broadway's Tony Award for Best Play, and was recently released as a major motion picture directed by Roman Polanski. 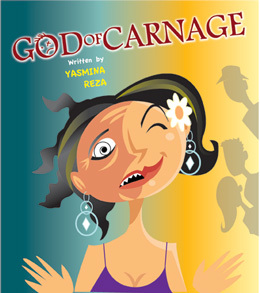 Prior to God of Carnage, Reza was best known for Art, also a smash Olivier and Tony Award-winning comedy. Other writing credits include Conversations After a Burial and Winter Crossing which each earned the prestigious Moliere Award. She translated Kafka's The Metamorphosis for Roman Polanski, and has written three novels: Hammerklavier, Une Desolation and Dawn Evening or Night. ICT's 2012 season is its 27th and the first selected by desai in her new role as artistic director. Subtitled "Adults Behaing Badly... unless They Ain't," the lively 5-play series marks ICT's commitment to new works and development, with two West Coast premieres: the political musical The Fix ("politicians behaving badly") and Michael Hollinger's provocative drama Ghost-Writer ("ghosts behaving badly"). The remaining two plays are Ken Ludwig's Leading Ladies ("men behaving badly") and the musical revue Ain't Misbehavin' (but...one never knows, do one?). "The enthusiastic response to our season announcement has energized us all," notes desai, who was recently honored with a Long Beach Rosie the Riveter 'We Can Do It' Award. International City Theatre is Long Beach's Resident Professional Theater at the Long Beach Performing Arts Center and the recipient of the Margaret Harford Award from the Los Angeles Drama Critics' Circle for Sustained Excellence in Theater. "Our orchestra section only has five rows, so we can guarantee that the audience will experience Reza's deliciously wicked comedy in an all together new way," she says. Set design for God of Carnage is by Stephen Gifford; lighting design is by Jeremy Pivnick; costume design is by Kim DeShazo; sound design is by Chris Kittrell; hair and wigs are by Anthony Gagliardi; props are by Patty and Gordon Briles; casting is by Michael Donovan Casting; and the stage manager is Pat Loeb.